크라쿠프, 폴란드의 모스키토 호스텔 | 호스텔월드에서 예약하세요. 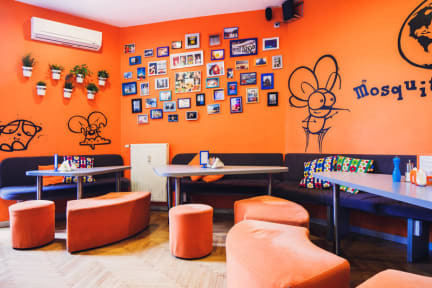 Mosquito Hostel Krakow cancellation policy is set out to be fair to the client whilst compensating us for lost booking opportunities brought about by your cancellation. The amount we charge the client for making a cancellation is related to the time Mosquito Hostel has to find alternative bookings and the cost of returning the funds. Therefore, to reduce unnecessary cost to both parties, we ask for the client to notify us of a cancellation as early as possible. For regular bookings we ask to be notified no later than 48 hrs. before your scheduled arrival date ( till 00.01 am two days before your arrival). In case of a group booking cancellation we ask to be notified at least 7 days before your scheduled arrival date, to avoid being charged. In case of a cancellation of a group booking between 7 to 3 days before your arrival date 50% of the overall booking amount will be charged to the clients credit card. In case of a no show or cancellation of a group booking between 3 to 1 complete days before the specified arrival date 100% will be charged. In case of a reduction in the number of people arriving by more than 20 %, we require that the group covers the costs of the beds that are not occupied, depending on the remaining time prior to arrival as per our cancellation policy stated above. Mosquito Hostel collects 100 Euro damage deposit and a key deposit depending on the quantity of keys. The damage deposit and key deposit must be paid in cash in exchange for the keys to the rooms. The deposit will be returned in full upon checkout assuming there is no damage to the hostel. We will charge for any major damage to our properties or the breakage of any significant items during your visit. Charges will be made in a fair manner in regards to the damage made or to replace the broken objects. A Group is required to send us a credit card CVV code right after making the reservation. Other wise the reservation will be canceled. No stag / bachelor / hen parties !! Starting April we accept only groups for more then 6 people are not accepted. If you book more then 6 people with different bookings we have a right to refuse to check you in and you will be charged for the 1st night of accomodation. 번역 모기 호스텔은 매우 중앙에서 모든 주요 명소에서 도보로 이동할 수있는 거리에 퍼팅, 올드 타운의 북쪽 입구 바로 옆에 위치하고 있습니다. 이 현대적인, 친절한 호스텔 기능은 매일 밤 저녁 식사, 음료, 게임 및 이벤트를 무료 - 직원과 동료 여행객을 만날 수있는 좋은 기회. 완비 된 주방은 무료 아침 식사, 무료 세탁 및 무료 Wi-Fi 인터넷,도있다. 우리는 아우슈비츠, 엘 리치 카 소금 광산 자코 파네 자신의 할인 여행을 좋아합니다. 모스키토 호스텔은 크라코프(Krakow)에서 가장 편리한 곳에 위치해 있습니다. 역과 메인 광장(Main Square)이 도보로 불과 5분 거리에 떨어져 있기 때문에 무거운 짐을 들고 시내를 빙빙 도는 어려움 없이 빠르게 도착할 수 있습니다. 배낭여행객이 원하는 모든것! 모스키토 안에 다 있습니다. 배낭여행객들의 천국이라 불리는 모스키토 호스텔! 술을 가져와서 편하게 마시고, 저녁을 무료로 즐기며, 세계 여러 나라 사람들과 친해지는 시간을 갖는 건 어떨까요? 저녁까지 알차게 보내보세요. 프라이빗룸(트윈/더블/트리플룸)과 도미토리룸(6인실/10인실/12인실)을 포함해 총 10개의 객실이 있습니다. 도미토리룸 전용 욕실 3개가 준비되어 있고(24시간 내내 온수 사용가능), 두꺼운 매트리스가 놓인 침대에는 독서등이 구비되어 있습니다. 편안하고 깨끗한 침구류도 제공해드립니다. 휴게실이 별도로 마련되어 있으니 부담 없이 방문하세요. 게스트 전용 주방과 흡연이 가능한 발코니로 바로 이어지는 휴게실도 있습니다. - 평일 저녁식사 제공! 여러분을 위해 요리해드립니다! 여러 가지 파티와 소모임을 기획하여 전 세계 여행자들이 경험을 공유할 수 있도록 하고 있기 때문에 여행자라면 누구나 좋아할 만한 호스텔입니다. 새로운 친구를 만들고 싶으신가요? 맥주 한잔을 하면서 호스텔 분위기를 즐기고 크라코프를 탐험하고 싶다면 바로 이곳이 당신이 찾던 호스텔입니다. 서로를 존중하는 호스텔을 만든 것이 전세계 고객 여러분께 많은 사랑을 받고 있는 이유입니다. 저희 호스텔은 끝없이 마시고 즐기기만 하는 파티 호스텔이 아닌, 서로 존중하며 편안하게 생활할 수 있는 호스텔을 만들기 위해 최선을 다하고 있습니다. 고객 여러분이 다른 여행객들과 어울리고, 낮 동안의 피로를 풀며 깊은 잠을 잘 수 있는 또 하나의 집이 되어드리는 것이 저희의 가장 큰 목표입니다. 화요일 – 플립 컵스 게임 (FLIP CUPS game) 도전! 다른 팀과 겨루는 시간! 수요일 – 게임 나이트(GAMES NIGHT) 다른 여행자들을 이겨라! 토요일 – 밤 9시 휴게실에서 만날 수 있는 폴란드 보드카 샷(POLISH VODKA SHOTS)! 놓치지 마세요! 모든 이벤트는 무료로 개최되니 주저하지 말고 참여하세요. - 호스텔 앞에서 픽업, 추가 요금 없음. 아침 일찍 도착하셨나요? 걱정 마세요. 얼리 체크인(early check in)을 마치고 휴게실에서 객실이 준비될 때까지 편안하게 쉬면서 기다릴 수 있습니다. 모스키토 호스텔은 친근하고 친절하며 젊음을 느낄 수 있는 분위기를 갖추고 있습니다. 또한, 언제든 고객 여러분이 더 멋진 장소에서 식사를 하고 만족스러운 관광을 하며 저렴하게 티켓 등을 예매할 수 있도록 최선의 노력을 다하고 있습니다..
크라코프에 오셨다면 선택은 오직 모스키토 뿐입니다. 예약 전 유의사항을 반드시 읽어주시기 바랍니다. 문의 사항이 있으면 언제든 연락주세요. 2층침대 올라 갈때 제외하고는 모든게 좋습니다. 직원들 친절하고 채크인때 크라크푸에 대해 모든걸 알려 줍니다. 밤에 호스텔숙박자들하고 같이 놀고 호스텔 앞에는 24시간 알콜샾이 있습니다. 샤워시설 식당 모든게 좋습니다. 호스텔에는 매일 이벤트가 있고 공용 공간은 매우 활기찼었다. 하지만 열쇠를 받을때, 우산, 수건을 빌려야 하는 경우 모두 데파짓을 각각 따로 내야했다. 데파싯을 한번에 묶어서 낼 수 있었음 좋겠다. 위치가 중앙역이랑 버스정류장이랑 같이 있는 백화점까지 도보로 7분 걸려서 완전 좋았어요! 대신 구글 맵은 돌아서 알려주니까 백화점출구를 이용해서 나오신후 숙소가 있는 방향을 향해 길을 찾아서 가셔야 더 빠르고 편합니다! 아침은 4가지 종류의 시리얼과 샌드위치를 만들어먹을수 있을 정도의 빵과 속재료들, 소스가 있습니다! 주변에 큰마트도 있어서 이용하기에 편하고 침대도 콘센트랑 스탠드 있어서 편합니다! 화장실도 깨끗하고, 쥐린놰가 족흠 마니 놔서 저는 다가치 씌는 황장실을 이용했습니다! 또 샹웡실 슈얍이 족흠 얅햐고 끍단적으로 뇅수와 온슈가 나와성 씼끼가 휨들었흡니다! 위치는 중앙역에서 10분정도로 되게 가깝습니다. 엘리베이터도있어서 짐 옮기는것도 편하고 숙소 바로앞에 구시가지 입구여서 관광하기도 편합니다. 락커도 되게커서 캐리어 넣기도 좋고 매일저녁 호스텔에서 파티같은것도 해서 다같이 어울려서 놀기도 좋습니다. 그래서 조용하게 지내다가고 싶은분들한테는 다소 시끄러울수도있습니다. 크라쿠프 역에서, 올드타운에서 매우 가까움. 식당과 복도에 에어컨 나옴. 2인실 우리 방에 에어컨 안 나옴. 나와 동행인은 더위를 안 타서 괜찮았음. 11시까지 매일 밤 식당에서 무슨 게임을 함. 시끄러움. 샤워실에 물 잘 안 내려감. 오슈비엥침 투어 예약 호스텔에서 안 했다고 아침에 길 엄청 막혀서 시간 못 지킬 수도 있다고 엄청 여러번 말해서 짜증났으나, 다음날 아침 버스시간 알아봐줌. 매우친절함. 아침 식사도 괜찮음. 그리고 직원들이 예쁨. 한국에서 볼 수 없는 옛날 엘리베이터여서 느낌이 새로움.